The wedge tie (WT) is a form tie that secures concrete forms in place while the concrete is poured. It easily installs between form boards and accurately spaces the forms. Several models are available for varying wall thickness and types of form boards. Designed for low foundation wall applications. 5/8"-wide formed "V" design for rigidity allows accurate form spacing and support. Sizes now available for composite form board. Wall thickness from 6" to 12"
The spacing of the WTs along the length of the form depends on the depth of the WT in the form. The spacing does not depend on the thickness of the wall. 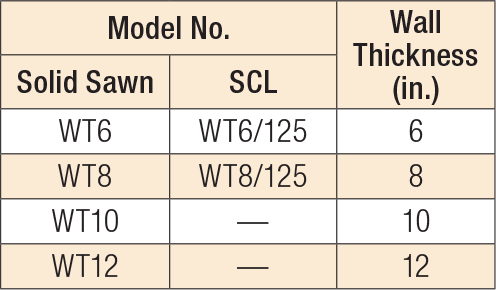 The maximum recommended spacing for WTs used with 1x, 2x and 1 1/4" thick forms is outlined in the tables below. The tables give spacing guidelines for various form heights and types of form boards. In general, the higher the form is, the closer the spacing of the WTs should be. WT See specific model numbers for code listings. WT10 No evaluation report listing. WT12 No evaluation report listing. WT6 No evaluation report listing. WT6/125 No evaluation report listing. WT8 No evaluation report listing. WT8/125 No evaluation report listing.